For the Sonic & Knuckles level, see Hidden Palace Zone (Sonic & Knuckles). For drx's website detailing video game prototypes, see Hidden Palace. Hidden Palace Zone is a scrapped level from Sonic the Hedgehog 2. It is an underground zone with purple water, featuring sparkling gems and dinosaur-esque badniks. Hidden Palace Zone is perhaps the most infamous of the scrapped Sonic 2 levels due to its widespread appearance in gaming media before the game was released. The majority of the art in the level was created by Craig Stitt. 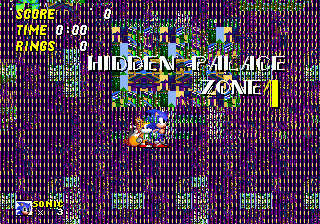 Hidden Palace Zone was never completed for the original release; however, a good portion of the first act is playable in the Sonic 2 Nick Arcade prototype and the Sonic 2 Simon Wai prototype. It was one of the first levels to be worked on, however progress stopped early during production. It was nevertheless kept in the game throughout most of Sonic 2's development cycle, with its removal being a last minute decision. This is contrary to Wood Zone and Genocide City Zone, which, culled much sooner, were largely kept a secret. Notable features of Hidden Palace include green bridges which glow if Sonic or Tails walk on them. This is actually the same object as the bridge in Emerald Hill Zone, but is set to glow if the level number is that of Hidden Palace's. 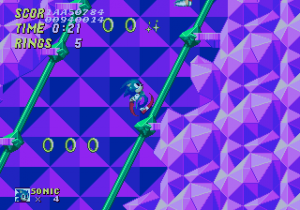 Also featured is a large ramp towards the end of the level, whose collision means it cannot be climbed without positioning Sonic on it with debug mode. Moving up this ramp will lead to the top of the screen, however using debug mode again will show that it continues at the bottom of the level, leading to a bridge covered in waterfalls and inevitably a platform to nowhere. 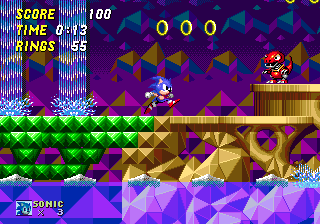 Unlike other scrapped levels in Sonic 2, Hidden Palace Zone still remains in a corrupted form on the final version of the cartridge, though can only be accessed through game enhancers such as Game Genie. The level plays the unused track 10 in the final game, but opted for the Mystic Cave Zone 2-player music track in the Simon Wai prototype. A second act can also be accessed, but it is a barren version of the first act in all versions of the game. The zone has an icon, intended for the level select screen, but is never seen in normal play. Oddly, it does appear in Sonic the Hedgehog 3 however, as this game recycles Sonic 2's level select with minimal alterations. An interview with Yuji Naka revealed that Hidden Palace Zone was originally intended to be a level where the player would be warped to after collecting the 7 Chaos Emeralds. Once there, they would receive the power to morph into Super Sonic. The idea was ultimately killed and the ability was given to the player immediately. Craig Stitt, in an interview with ICEknight, mentioned that Hidden Palace Zone started as two acts but then switched to a single act before being canceled. Early mockups of the level circulated across magazines back in the day. Many parts of the level were once grounds for debate, such as the so called "Master Emerald" which blocks a pipe. In actuality, this was meant to be just a breakable object similar to the ones found in Hill Top Zone and Chemical Plant Zone. The Tails 1-up monitor was once thought to be a sign that the level was a Tails-exclusive zone, though we now know it exists due to object subtype changes, as the monitors in this Zone seem to have been placed with the subtypes from the original Sonic the Hedgehog in mind. Some hacks, like Sonic 2 Delta and Sonic 2 Long Version, have attempted to restore the level using the graphics from the prototype version and level map and object data from the graphic-less version in the final release. Hidden Palace was removed but not forgotten. 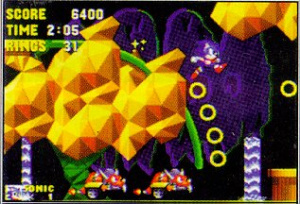 The name was recycled in Sonic & Knuckles for use in an unrelated level, and some of the background art was re-used in Sonic Spinball's Toxic Caves, also designed by Craig Stitt. Some elements like the glowing bridges and spheres in the background were used later in Sonic 3's IceCap Zone as well. The zone was finally restored 21 years later, as a single-act level in the 2013 remake of Sonic 2. When Hidden Palace Zone was first made accessible to the public, there was much speculation about the existence of a Tails 1-up monitor at the start of the stage. Sonic 2 was built off Sonic 1, and early in development monitor designations were reassigned. The object subtype number for the Tails 1-up monitor was originally the object subtype number of a Sonic 1-up monitor. The early Nick Arcade prototype places Tails 1-up monitors in Green Hill Zone where the Sonic monitor should be. The shield monitor in the beginning was also presumably meant to be a 10 rings monitor, based on the changes in object subtype numbers. Some say the complexity of having both water and vertical wrap-around may have led to the level being scrapped. Unlike other scrapped levels, Hidden Palace contained enemies, none of which were seen in the final build of the original game. Some enemies were not given official names. It is also the only level in any of the Mega Drive Sonic games where enemies re-spawn if not on-screen. Redz - Dinosaur badnik, A little red dinosaur to be jumped on. BBat - Bat badnik, Attacks in a U- shaped pattern. The Nick Arcade prototype also includes Stego, another dinosaur badnik which will charge at Sonic and Tails if they come too close. BFish - Fish badnik, Acts like the Masher, except it attacks in an arc like motion instead of a straignt line. Bubbler - Air bubble badnik, Explodes when Sonic approaches. Or the Bubbler's Mother drops it in the water. Bubbler's Mother - Sometimes it drops the Bubbler. Or it acts like the Chop Chop badnik. Gator - a crocodile badnik which simply moves back and forth, similar to Redz. This badnik was actually seen in a mockup shot of Dust Hill Zone. Hidden Palace is accessible in the final version of Sonic the Hedgehog 2 by using the Game Genie code ACLA-ATD4 (AB6X-ATBR in Knuckles in Sonic 2). From here, enter the Level Select code (19, 65, 09, 17 with in the sound test screen). Go back to the title, and hold + to access the level select screen. 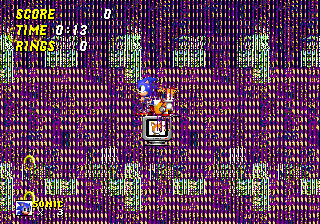 Then select Death Egg Zone (Special Stage in Knuckles in Sonic 2). Almost all of the artwork is gone in the final game, and with this goes collision data, making the zone virtually unplayable without enabling debug mode (1, 9, 9, 2, 1, 1, 2, 4 with at the level select screen). It is impossible to complete the level without placing a capsule with debug mode. All the items in debug mode that you place are from Oil Ocean Zone. "Beating" both acts will take the player to Oil Ocean Zone. While the Tails monitor object does not grant an extra life in the final, it is, however, fully functional in Knuckles in Sonic 2. The art for the title card is intact, but the level art is completely gone. The Sonic the Hedgehog 2 remake for mobile platforms adds Hidden Palace Zone as a bonus single-Act Zone, courtesy of Taxman and Stealth from Sonic Retro who worked on the project. Uniquely, this level is not encountered in the normal level progression; instead, it is a secret Zone whose entrance is hidden in an existing stage. The Zone's entrance is located in Act 2 of Mystic Cave Zone, replacing what was previously an inescapable pit of spikes. In this version, jumping into the pit will instead initiate the transition to Hidden Palace Zone. The level has been completely reworked based on the original assets and sprites seen in the Sonic 2 prototypes. This version of the level uses a brand-new level layout created from scratch, though some areas intentionally share similarities with the layout seen in prototype versions of the original game. The music used for this zone is the 2-Player music for Mystic Cave, as was seen in the Simon Wai prototype. New gimmicks have been added for this version of the stage, including water pipes which blast you through tubes, and ziplines which thrust you upward using the slanted shafts seen in the prototype layout. The curved water slide now functions as intended, and the large Emeralds are now breakable objects concealing springs. The Redz, BBat, and Stegway (formerly Stego) badniks are fully functional and present throughout the stage. Redz now behaves differently to the original scrapped version; in addtion to simply walking back and forth, it now stops occasionally to breathe a stream of fire from its mouth. In addition, an all-new badnik exclusive to this version of the game, Jellygnite, inhabits the underwater sections of this level. Also exclusive to this version of the game is the boss of this stage, Brass Eggman. Eggman pilots an Eggmobile with a gigantic trombone attachment, which emits loud blasts of noise that cause rockfalls from above. He also drops large bombs into the water, which will explode creating a brief vertical jet of water. If the water jet hits the player, they will take damage; however, if the jet instead hits Eggman, it will briefly disable his Eggmobile and he'll fall to the ground, allowing the player to damage him with a Spin Attack. As of version 3.0.9, the original version of the stage, as seen in prototype versions of the original game, can be accessed through a code on the stage select menu. After entering the debug mode cheat, playing the sounds 03, 03, 03, 0B, 10, 10, 10, 04 and selecting "Hidden Palace" will take the player to the Proto Palace Zone, which is Hidden Palace's original layout as seen in the Simon Wai prototype. Unlike its revised counterpart, this version of the stage uses Track #10 as its default background music. 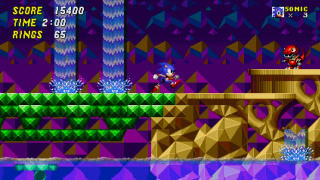 The single giant emerald present has a unique behaviour only seen in this version of the stage, acting as a warp which takes the player back to the stage select.